Welcome to America where the ruling class, in pursuit of wealth and power such as we see for example surrounding the Trump/Clinton presidential campaigns, pretend that this government protects and defends fundamental human, civil and constitutional rights of our people. The reality is that most of the citizenry of the USA are mired in a apathetic state of dismissiveness even in the face of atrocities ongoing and committed by fbi/cia/dod on both domestic & foreign soil. 'When will they ever learn'? Some French learned the lesson of indifference when Nazi murderers swept across Europe in WWII, but memory is buried with the interred bones of the victim's of Nazi war criminals like Mengele. Today, many and perhaps most Americans follow the dictates of fbi/cia torturers and assassins and accept as normal the unnecessary wars, conflicts, and mass murder/imprisonment of our fellow human beings globally. "Had all of us in France meekly, lawfully carried out the orders of the German master, no Frenchman could have ever looked another man in the face. Such submission would have saved the lives of many -- some very dear to me -- but France would have lost its soul." Today, America has lost its soul and the people have surrendered their destiny to the most despicable group of human monsters ever to wield their bloody swords on man: the fbi/cia and their operatives worldwide. Indeed, the advanced tools used by the American psychopathic, government agents in their conquest mentality include high tech, directed energy weaponry; sophisticated psychological operations and advanced chemical/biological/viral warfare techniques, also combine to define the USA's assaults on humans as unprecedented in human affairs because such atrocious assaults have never been possible, nor used before now. Some of us, such as I, have endured some of these assaults to the extreme degree and we have tried to bring atrocities committed by this overthrown Nazi-type regime to light, but to no avail. The leaders of the nation , the main stream media and the general population all flippantly dismiss our cogent reports of inhumane attacks and crimes against humanity. So, one must ask how can such an American look another in the face while the MAFIA government agents openly engage in horrible crimes against political Targets. On many occasions the fbi/cia actually recruit police and citizen-operatives to help terrorize, imprison or kill the defenseless victim, even as the SCOTUS and Congress look on. 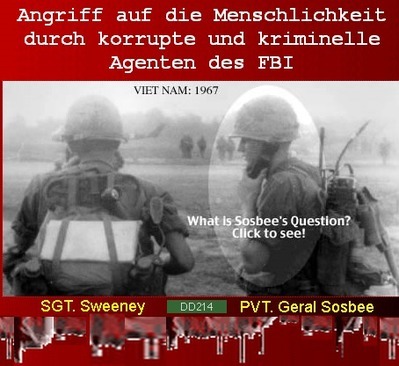 To see who among us are carrying out and supporting the unlawful orders of the fbi in their life threatening attacks on me and others, see my reports, posts and articles on these characters/cops: Knipfing, Rodriguez, Wilson, Bleier, Posada, Cruz, et. al., online , and see my various papers on topic at https://ttu.academia.edu/geralsosbee.